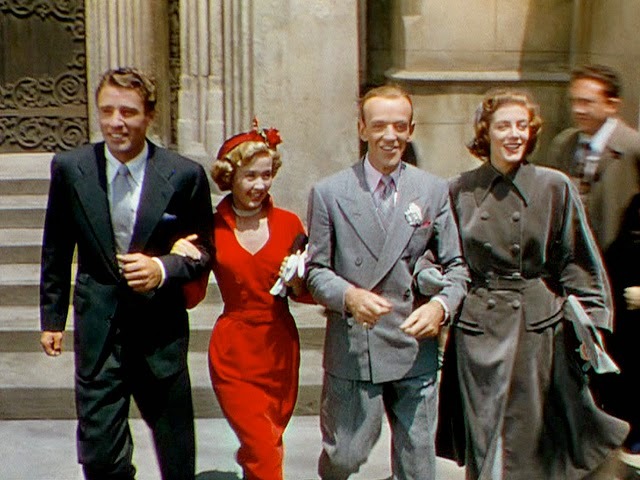 A Fred Astaire musical set mostly in London on the eve of Princess Elizabeth's wedding in 1947, Royal Wedding offers breezy fun and plenty of comic romance, but the musical numbers rarely rise above average. Popular brother-and-sister Broadway musical act Tom and Ellen Bowen (Astaire and Jane Powell) are both happily not married. Tom is dedicated to his craft and has no time for romance, while Ellen toys with men for a matter of days at a time and leaves a trail of broken hearts in her wake. When their agent Irving (Keenan Wynn) arranges for the Bowens to star in a London show in the lead-up to Princess Elizabeth's royal wedding, Tom and Ellen jump at the chance. On the boat to London, Ellen meets Lord John Brindale (Peter Lawford), a British man who shares her love for quick affairs and no commitments. But Ellen and John start to seriously care for each other, and once in London, Tom meets and falls in love with back-up dancer Anne (Sarah Churchill), although she tells him that she is engaged to a man based in Chicago. With the London show a big success, Tom and Ellen find their new romantic relationships complicating their previously straightforward lives. Royal Wedding has a few drawbacks that prevent it from joining the absolute top ranks of 1950s musicals. Jane Powell was at least third choice for the role of Ellen. June Allyson (pregnancy) and then Judy Garland (absenteeism) both dropped out. Plucked from the obscurity of MGM's low-budget second tier musicals, the 21 year old Powell is ironically more watchable as an actress with a deft comic turn than as a musical performer. Her singing is unremarkable despite a good range, while her dancing is passable without ever being memorable. Sarah Churchill is another drag on Royal Wedding. 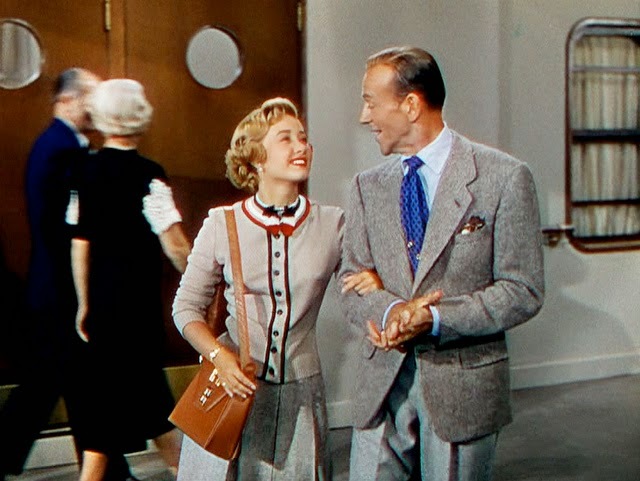 Winston's daughter, labouring under the misconception that she has a future in acting, is a wooden, unconvincing presence, and there is never a threat of chemistry with Astaire. Her casting must have surely been a stunt to trade on her father's name in the British market. With Peter Lawford his usual anonymous self, the most passionate relationship in the film is between Tom and Ellen. As siblings singing and dancing together often in vignettes with romantic undercurrents, there is a scratchy discomfort in the physical and emotional closeness on display between brother and sister. But there are also several positives to enjoy. Deprived of a stellar partner, Astaire delivers two brilliant solo dances. In Sunday Jumps he dances with props in the gym of the cross-Atlantic ship, turning a hatstand into an elegant companion. And in You're All the World to Me, Astaire seamlessly dances on the walls and ceilings of his hotel room. It is one of Astaire's most famous on-screen highlights, an eye-popping technical achievement delivered with aplomb by director Stanley Donen. In the best of the Astaire/Powell dances, they slide with the waves as the Atlantic high seas turn their dance floor into a tilting surface. Keenan Wynn is a delight in the dual role of New York-based Irving and his twin brother London-based Edgar, and he gets to enjoy a couple of humorous telephone conversations with himself. Overall, Royal Wedding enjoys a steady current of wry comedy that makes up for the more creaky elements of the production. A polished and colourful event despite suffering from some unruly moments, this wedding is still well worth attending.